AJA's Mini-Converters are well known worldwide for their reliability, robustness and power across a range of conversion needs. Select the appropriate category for your in field or studio needs. The Ki Pro family of digital file recorders and players cover a range of raster, codec and connectivity needs in different formats suited for the field, equipment rack or facility. Explore AJA’s solutions for editing, color correction, streaming and much more in the field or flexible facility environments with the Io and T-Tap products. From Composite, Component, 3G-SDI, HDMI to Broadcast IP, AJA desktop solutions provide you the needed I/O for any given project. Explore the KONA desktop I/O family to learn more. AJA offers a wealth of free software for control, configuration, testing and capture and playback needs. U-TAP for streaming over USB3, HELO for standalone H.264 recording and streaming and Io 4K and Io 4K plus for multi-channel I/O streaming needs. openGear and AJA Rackframes and Converters for convenient rack based conversion, DA and fiber needs. KUMO routers range from 16x2 to 64x64 for 3G-SDI format agnostic routing with convenient control and Salvo recall and configuration with the KUMO CP2 control panel. Choose CION for production camera needs or RovoCam for a simple UltraHD/HD camera solution for single cable needs with HDBaseT support for a range of workflows. AJA offers a range of media for both Ki Pro Rack with KiStor drives and Ki Pro Ultra, Ki Pro Plus and Ki Pro Quad with Pak media. Explore docks, eSata connectivity and more. AJA offers both the desktop based KONA IP with support for 2022-6/7 and upcoming 2110 support as well as optional JPEG 2000 over IP. AJA’s range of IPT Mini-Converters bridge SDI and HDMI to JPEG 2000 over IP with minimal latency. The Corvid lineup of developer cards and SDK options for KONA and Io desktop and mobile solutions offers OEM partners’ a wealth of options. Explore to learn more. Scan Converters for Region of Interest extraction from SDI, DVI, DP and HDMI. HDBaseT Converters extend UltraHD or HD HDMI signals up to 100 meters over Cat 5 (or better) cable, utilizing the industry standard HDBaseT protocol. Choose Ha5 Mini-Converters for conversion from HDMI to SDI and Hi5 Mini-Converters for conversion from SDI to HDMI. Mini-Converters ideally suited for up, down or cross-conversion for raster or scan conversion needs. Convert to and from Digital or between Analog Video standards. AJA FiDO fiber converters expand your range all the way up to 10km with Single-Mode. Transceivers, transmitters and receivers available with SC or ST connectivity and LC Multi-Mode, CWDM or Single Mode options. Distribution Amplifiers, Muxers, DeMuxers, Genlock, Audio Embedders and Disembedders; all in a robust reliable form factor for your infrastructure needs. Learn about AJA solutions for HDR, Thunderbolt, with more to come! The latest press releases on the most exciting product releases and top news stories from AJA. Stop by regularly to see what AJA is up to around the world and join us when possible! Our users are putting AJA solutions to work in exciting and innovative ways. Subscribe to our RSS feed or monitor this page for all news on product releases, updates and more. Download the latest firmware, software, manuals and more to keep current with the latest releases from AJA. AJA is dedicated to ensuring your success with our products. Technical Support is available free of charge and our team will work with you to help answer questions or resolve any issues. If you have an AJA product, please register on this page. Having your registration on file helps us provide quality Technical Support and communication. Third-party support information and downloads. Learn more about AJA’s history and leadership in the video and broadcast space. Images and logos for all products suitable for print and more. Reach AJA via phone, email and fax. AJA IP Mini-Converters are designed for the transmission, transport and reception of IP video for both encoding and decoding. Models are available for either SMPTE ST 2110 uncompressed video and audio over IP with 10 GigE connectivity, or JPEG 2000 TR-01 video and audio over 1 GigE. Rugged, compact and reliable, these practical Mini-Converters provide the bridge between baseband and IP video for a range of applications. 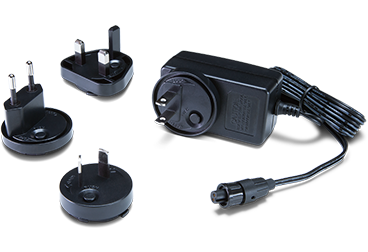 All AJA Mini-Converters ship with a universal power supply that includes international plug connections for use around the world. 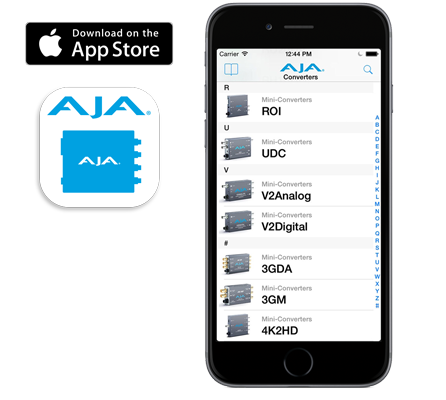 Mini-Matrix offers information on the complete line of AJA Mini-Converters as a convenient search tool, available online and as an iOS app. The Mini-Converter product line is extensive and this app helps you find the right converter for any situation, wherever you are. Please click here to use Mini-Matrix to help find the AJA Mini-Converter you need. The free AJA Mini-Matrix app for iPad® and iPhone® is available now in the Apple App Store. Individual products have links back to the main AJA website for more details and you can email product information directly from the app. AJA’s technical support is recognized as among the best in the industry and is available to all AJA customers. If you need assistance with any aspect of your Mini-Converter installation, configuration, operation or encounter any technical issue, AJA Support will work with you to get up and running. Mini-Converter products are covered by a generous five year international warranty. Want to learn more from AJA about new product announcements, updates, support items and more? Visit our Opt In page to choose all or just the information you need!